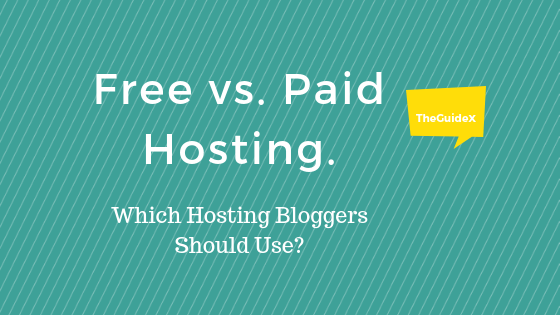 Free vs Paid Hosting — Which Hosting Bloggers Should Use? So are you someone who also look for the answer to this question on free vs paid, which hosting should bloggers use for their website? Some years back, I also searched a similar question on google but hadn’t found any satisfying answer to my question. I continued with some free hosting websites like infinityfree.net, 000WebHost, but nowadays if someone asks a similar question from me, I would suggest him to go with a paid hosting plans. The reason why I suggest them to use paid hosting because of their no force ads, better uptime and bulk of more useful features you would never find in any free hosting website. So, If you’re someone who is going to start your website and doesn’t even have some bucks to invest in the beginning, then I would suggest to spend $12/yr and get a paid hosting plan along with a free domain name from GoDaddy. Most of the people wouldn’t recommend using godaddy hosting because of their bad experience, but when I personally tried and optimized my website correctly, the experience at godaddy was quite decent. Even at the time of writing this post, I’ve some sites which are still hosted on godaddy. Is Free Hosting Website Really Free? 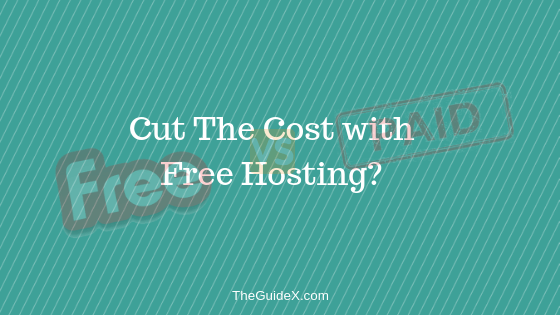 Do You Really Cut The Costs with Free Hosting? So have you ever think why free hosting website offer their hosting for free? How they earn money? 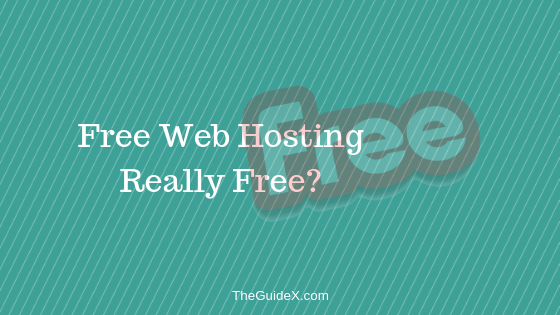 Are these web hosting sites are really free? The answer is BIG NO! They offer there hosting free of cost, but in exchange, they use your web page to get a credit link to their website, and also they use your web page to serve ads to your visitors through which they could generate substantial income. You’re opening a business website on the free hosting site, and they serve as through your web pages and eventually, one of your competitors also runs ads and the ads are served through your company web page. How bad is that? If you decide to migrate to paid web hosting, then you have full control over your website and all it’s web pages. The paid hosting giant will never advertise through your web pages, nor they add credits from the footer of your website page. For how many time you could stay on your free hosting platform? One day you’ve to migrate to a paid hosting website for prior support and service. Like most of free hosting sites get down at just 3–4 real-time visitors, then how they could handle more traffic if there is a sudden increase in traffic? At this event, they could get down and eventually for saving a few bucks; your business might lose more than these few bucks. Furthermore, if you think to migrate to a paid hosting and brandable domain name, then you’ve to start from the beginning. Yes, you heard it right! From the beginning, because with most free hosting sites, you wouldn’t get the option to redirect your website using “.htaccess” 301 permanent redirection option. This means that all your time and efforts spent on building the company website will vanish and you will have to start making it from the beginning. Yes, you heard right! Most free web hosting sites stop working one day. So if the free hosting which you use for your website can get stopped, then you might have to suffer from a massive loss. The cons with the free hosting site are that you can’t store the backup, So you’ve to suffer a lot in case they stopped. Of course, this also applies to paid web hosting but if this happens but, in this case, they provide you with the full backup of your website data, email data along with other stored data. With free hosting providers, you don’t have this option. Still, you’re confused between which hosting you should have to prefer? Let’s take a closer look at the advantages and disadvantages of using free or paid web hosting. On using free web hosting website, you may get a credit link in the footer of your site, and they also show tons of ads on your website, which can impact the overall performance of your website. And with using paid hosting websites like Hostgator, Bluehost, GoDaddy and some most significant web hosting giants, you can get full control over your site, and it’s data. You can control advertisement on your website, have a much better user impression and can also take control of everything. Some free hosting website provides a free sub-domain name with their hosting and with paid hosting you can get a branded domain name. E.g., let’s what do you think looks better? A website with URL example.blogspot.com or a site with branded domain name example.com? The first example is a subdomain of blogspot.com which you can get for free (You can also use these free website builder to start your website with free subdomain and later migrate to your custom domain name) where’s the second is a brandable domain name for your business. This is one of the biggest cons using a free hosting website. If you’re using a free web hosting, then you might have noticed that most of the time your website servers get down. If you don’t take it seriously, then it might harm your website, and it’s ranking on Google. So we always have to prefer using a hosting giant which provides better service, speed, uptime and also which provides better support. If anyhow your website resources get down, you have an option to contact support or raise your support ticket. Moreover, some of the biggest web hosting giants claim to refund 100% of your paid hosting amount, if they fail to deliver the 99.9% uptime guarantee. We have also compared two biggest web hosting giants, Hostgator and GoDaddy. Don’t forget to read the full comparison and review here. cPanel is one of the most powerful panels to manage your website hosting. They offer lots of features including DNS Manage, Email Accounts, FTP Accounts, One-Click SSL Integration, Softaculos Installer, and much more features. These features can be enough for any web developer to build a brandable website. With softaculos, you can install WordPress and 250+ other software free within a few minutes and install SSL in a click. Many free hosting websites offer cPanel with their hosting plans, but they also show tons of ads within the panel where’s on paid hosting website you can get rids of ads and better service. Furthermore, with paid hosting website you can explore tons of more features and a better firewall and security. Customer support is one of the most important tasks you have to check before buying a web hosting from any hosting giant. If your web hosting wouldn’t offer support to your website, then you should have to avoid using such creepy hosting plans. Research about their customer support online and read the review about them and their customer support on Quora and choose a hosting which suits all of your site needs. The free hosting website won’t offer support (as how much you can expect from the free hosting site?) where’s with the paid hosting plan; you can get 24×7 chat and ticket support. Some biggest hosting giant even offers call support which is again one of the noticeable features. Well if you still choose free hosting over the paid hosting website, then it means that you have failed to see what are the advantages of the paid hosting. Of course, it is vital to save money on but if you’re choosing a free hosting over the paid hosting to save some bucks on the domain name, hosting plans, and a website then it will definitely cost you much more if you think on the long run. Many biggest web hosting giants like Godaddy, Hostgator, Bluehost etc offer a massive discount on their hosting plans. Check out our coupons and deals section to save more on your hosting purchases. Moreover, you also get a free domain name with your hosting plans at Godaddy with 88% OFF on their hosting plans. Check out these godaddy coupon codes to save 88% OFF on hosting along with a free domain name of your choice. Definitely, I wouldn’t suggest you choose free hosting over the paid one. Yes, it can be good for a short run but definitely not for a long play. You can use free hosting to store your demo projects and also to host a website for a short period. Personally, I feel obsessed using these free hosting website and my experience wasn’t good enough with them. One moment comes in your life when you need support from their support center and also a better service, but at that moment, they fail to deliver the service. You might even suffer from downtime and obsessed with the quality of service they provide and you might think once to migrate to paid hosting, but you’ve to start from the beginning at that moment. You will save much more of your money, time and efforts if you start with your own company domain name, professional hosting and unique design. Just think about it in the long run. Thanks for providing great info about free vs. paid hosting. Thank you for your valuable comments Alisha ???? I am glad to gain this remarkable information from you.All the details you provide to us, it was very helpful and useful.Thanks for sharing this amazing post. this website so information and nice.